Are you planning a visit to Jordan? I really recommend a trip to Wadi Rum Desert. 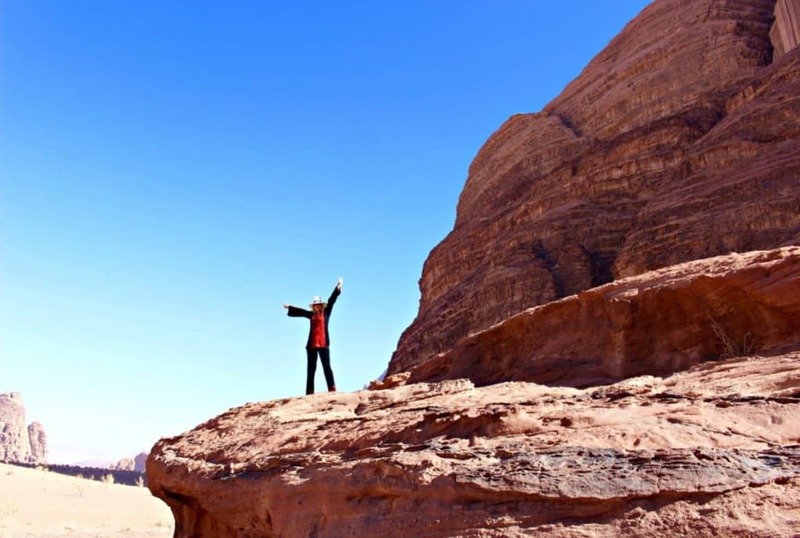 A red-rock wilderness between Petra to the North and Aqaba on the Red Sea to the south, it is a magical desert set amongst Sandstone rock formations and the most beautiful red sand. Wadi Rum means Roman Valley or Valley of the Rum. 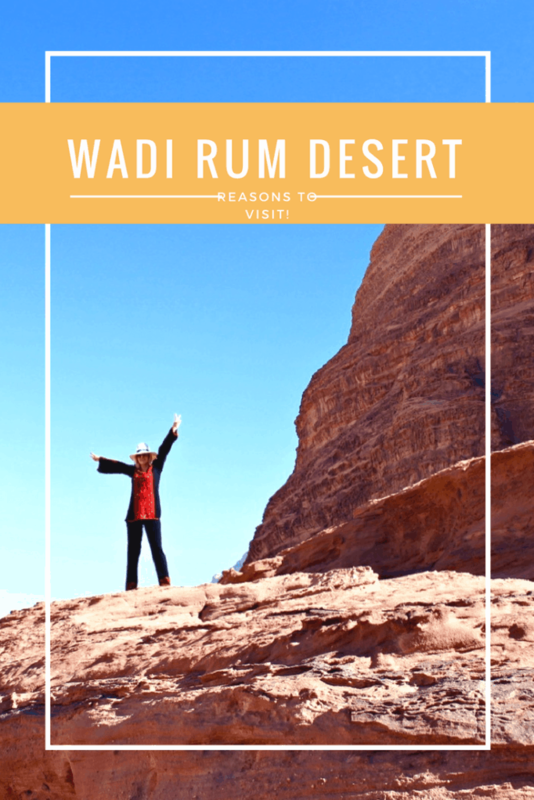 Wadi Rum Desert – explore Jordan. 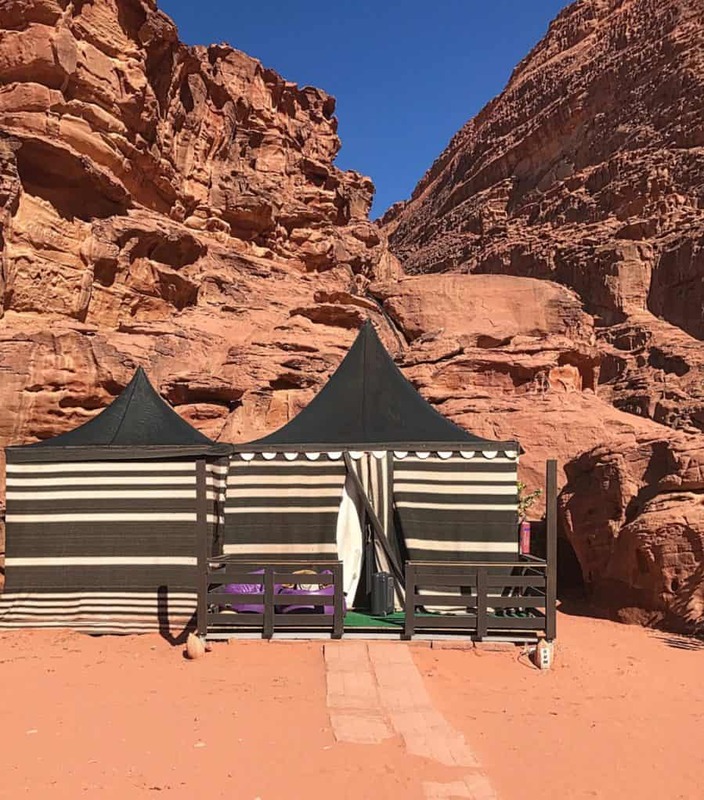 I drove from Aqaba, about an hour and a half drive and spent the night in a Luxury Desert Camp. To be honest, I nearly didn’t bother going! I thought, its just a desert, do I really want to go? Yes, Yes, Yes is the answer to that question. As soon as I arrived at the camp I was completely enchanted by the magnificent landscape and complete peace and quiet. PHOTO: Wadi Rum Desert entrance and visitor centre. My taxi dropped me off at the visitor centre. This was completely empty in mid January. I chose the perfect time of year to visit! The nights were chilly but the daytime gloriously sunny and warm but not hot. Wadi Rum Luxury camp sent a 4 x 4 to collect me and take me to the camp. After 10 minutes bumping along we arrived at the Camp. My tent was very comfortable with heating and an ensuite bathroom. My first time ever camping, or rather glamping! A complete pleasure to sleep in the desert, looking out at the stars and enjoying the unique atmosphere of Wadi Rum. The tent provided everything you could possibly need! Toothbrush, toiletries, strong shower, even a traditional Bedouin coat to keep me warm in the chilly evening air. I wanted to hike, explore and take some shots. What an adventure! There were only 5 other people staying at the camp as it was low season, this suited me perfectly and it was like my own private camp! The village of Rum is one mile above sea level. Popular climbs are Jabal Umm ad Dami at 6,000 feet and Jabal Qatar 5,000 feet. 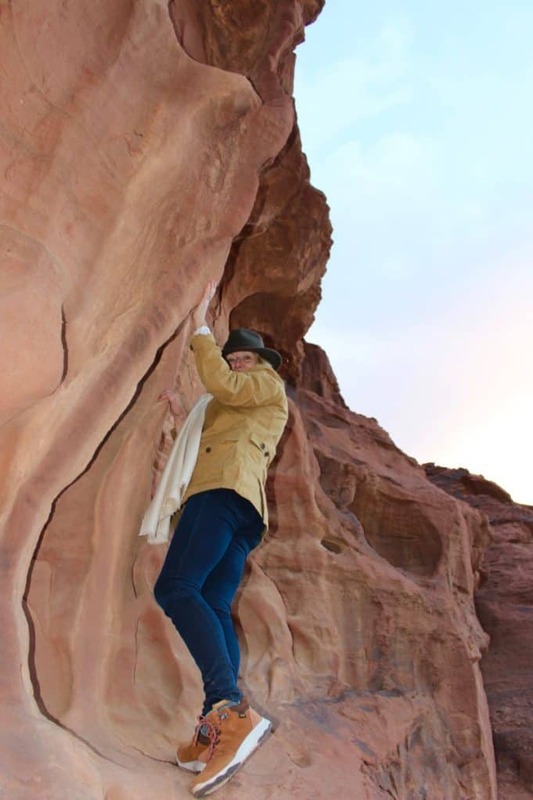 20,000 petroglyphs and 20,000 inscriptions have been documented tracing back 12,000 years are in Wadi Rum and there is evidence of Nabateans here from 300 bc. en route to Petra. The national park consist of 720 square kilometres of vast unpopulated very beautiful landscape. Wadi Rum is a World Heritage Site. I love to hike but you can rent a guide and 4 x 4 to show you around the desert or take a Camel trek. Next visit, yes …. 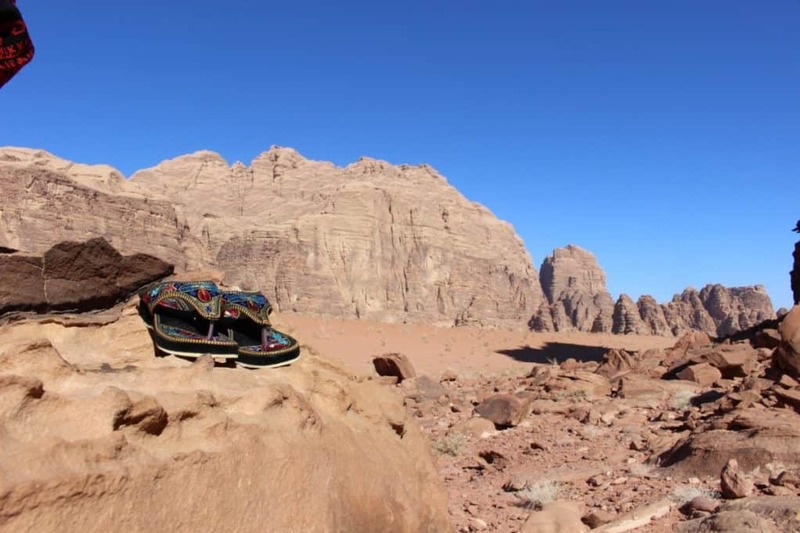 I want to go back again … I would like to trek across Wadi Rum for a couple of days on a Camel. 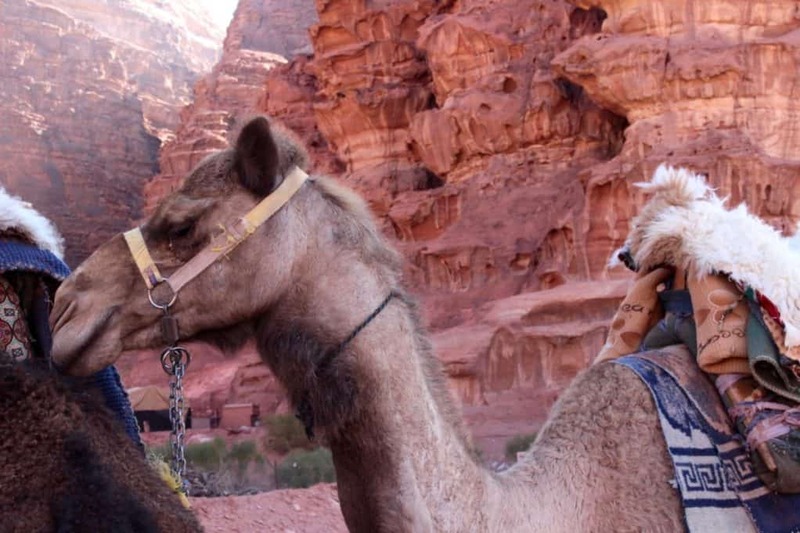 You could take a short camel trek for an hour or so too! The Camels are beautifully cared for by the Bedouin. For me, winter or Spring are the perfect times of year. The summer time is hot, so I guess it depends on what kind of weather suits you. 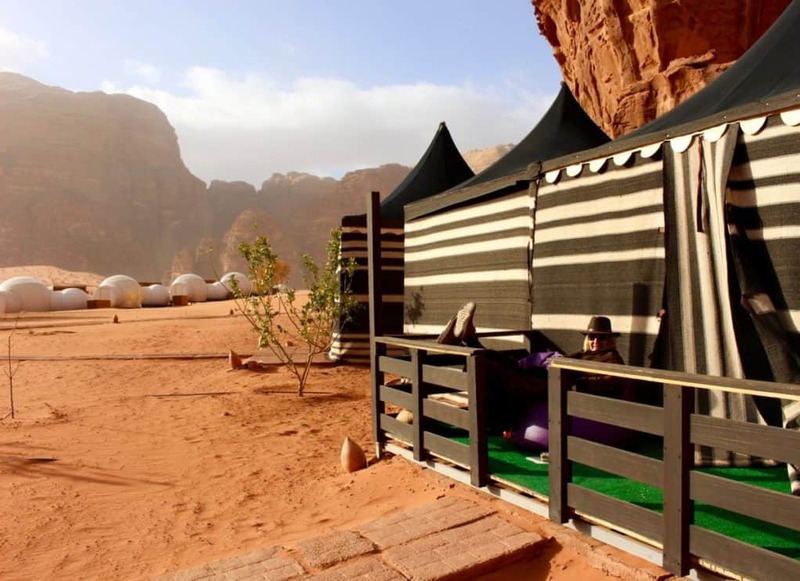 After a day exploring, enjoy a Bedouin meal in a traditional tent with Jordanian music softly playing in the background. There is no WIFI, no mobile phone signal which is actually very liberating, especially for a blogger! Sleep like a baby in a tent under the stars and wake up for breakfast and to explore some more! What to pack:: Pack layers, because the weather is changeable. Warm in daytime and colder at night. Walking boots are an essential, really happy I packed my Teva walking boots, great for climbing and walking. Don’t forget a water bottle, compass and snacks for hiking. Your GPS won’t work! I love my traditional Jordanian outfit with beautiful embroidery. I have some beautifully embroidered shoes, made in Jordan too. Aqaba is over an hour drive away to the south. Petra is an hour drive to the north. 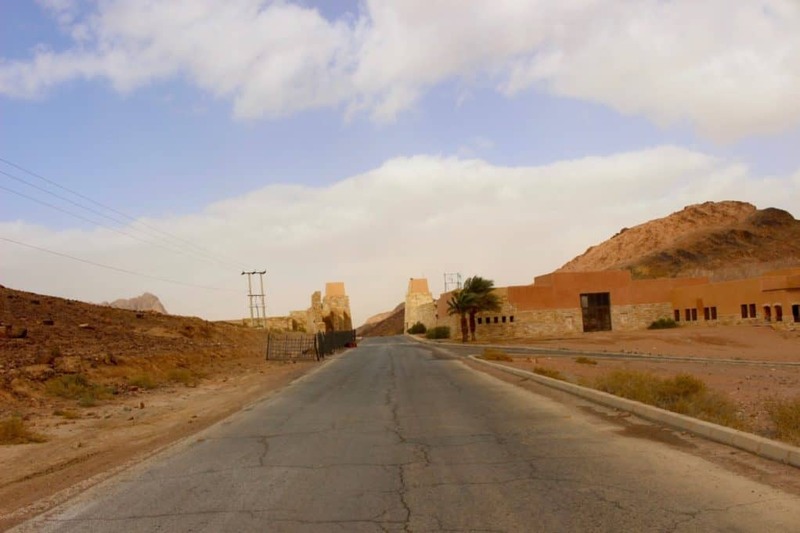 It is possible to take a day trip from either of these places and explore Wadi Rum. However, I totally recommend at least one night camping in the desert. It is an unmissable experience. 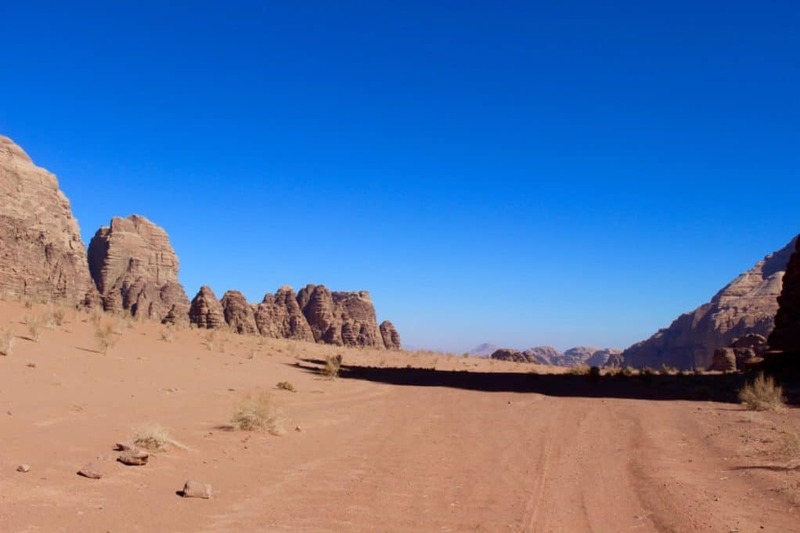 Wadi Rum is perfectly placed to be part of a driving tour around Jordan. I felt perfectly safe at all times in Jordan and I travelled alone. The roads are safe, the cars are driven sensibly, it is very easy to self drive or to book a car and driver. Jordanian people are very friendly and hospitable. The bedouin people could not be nicer. They want people to visit and enjoy their country. Do not hesitate to book a trip! I also stayed in Movenpick Petra, Movenpick Dead Sea and Movenpick Aqaba. 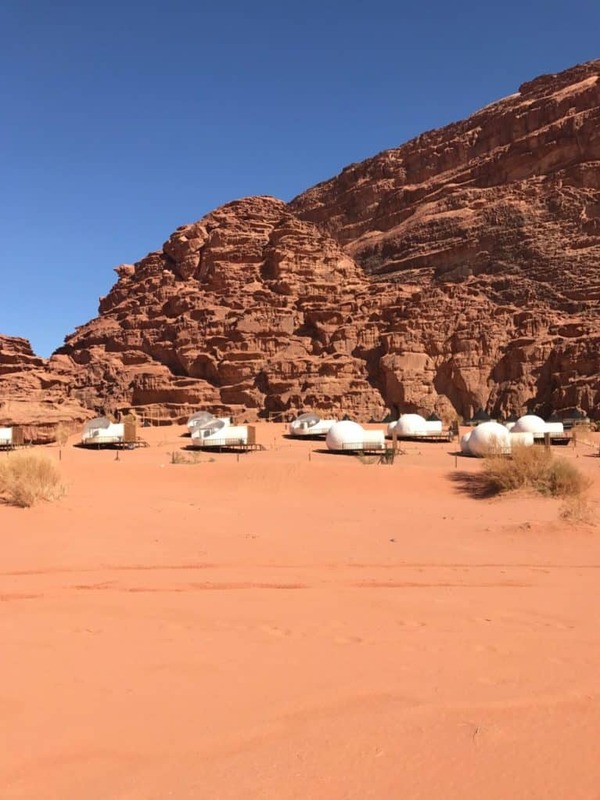 Do read my other blogs about Jordan and my hotel reviews if you are planning a trip to Wadi Rum Desert. 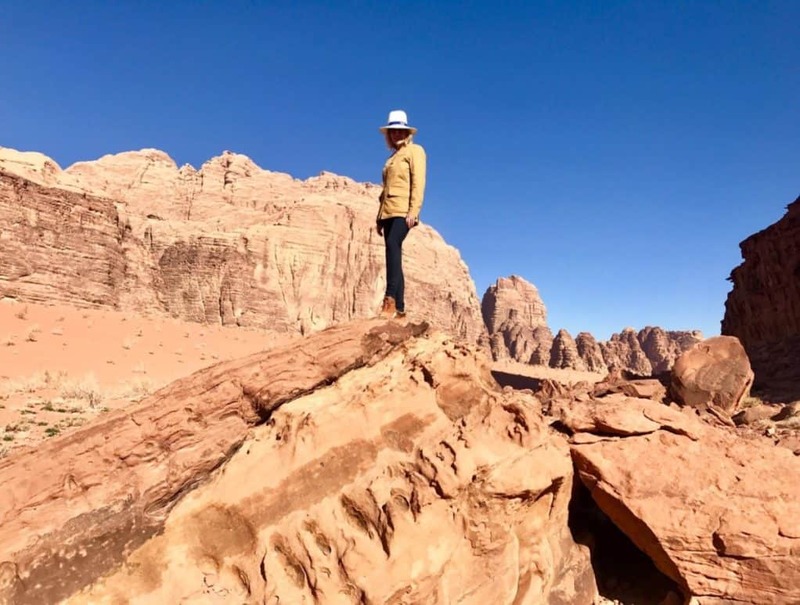 Previous Post Where to go in Jordan – My Solo trip to a magical land! Next Post So you want to be a Luxury Travel Blogger?